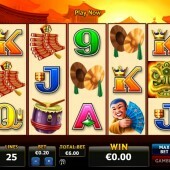 Here we are again, reviewing a slots title from Australian developer Aristocrat that has an Asian theme. This is familiar ground for fans of this company, that have garnered a reputation for launching a number of slots of a similar theme onto the market. If you are scrathing your head a this point wondering what I am talking about, here are a few examples; Dragon Emperor, Imperial house and Choy Sun Doa. Double Happiness is a 5 reel, 25 payline slot that immediately taps into feelings that those of us that have enjoyed previous Asian-themed slots from Aristocrat will have experienced before. The red background, the golden dragons, and the joyous musical ditty that begins whenever a win is triggered. This already has a good feeling about it. The symbols on Double Happiness are understandably Asian-themed. There is the Chinese man, Chinese drums, fire crackers, Chinese lantern, cymbals, and the regular 9-through-to-Ace icons across the reels. The Wild symbol can be found in the shape of the golden dragon head. This substitutes for all other symbols, except for the Scatters, to complete the potential winning combinations that appear across the reels on each spin. Speaking of the Scatters, these are represented by the Chinese text symbol. You will need three or more of these symbols to trigger the free spins bonus round. If you hit three Scatters you will earn 10 free spins. If you hit four Scatters you will win 15 free spins. If you are lucky enough to hit five Scatters then you will receive 25 free spins. It is possible to re-trigger the free spins bonus round. That is not where the free spins bonus round fun ends though. On Double Happiness, the Wilds take on extra responsibilities in the free spins by becoming Roaming Wilds. Two of these Roaming Wilds will appear on the free spins. On each spin, the Roaming Wilds will move one position. If they clash and land on the same symbol then any win involving that symbol will pay out a 10x multiplier. Double Happiness has all the hallmarks of a quality Aristocrat slot. The Roaming Wilds during the free spins is its unique selling point. Granted, this is something that the likes of NetEnt have done recently in a base game with their eerie The Invisible Man slot and its Walking Wilds but the pay outs are still nothing compared to this slot. 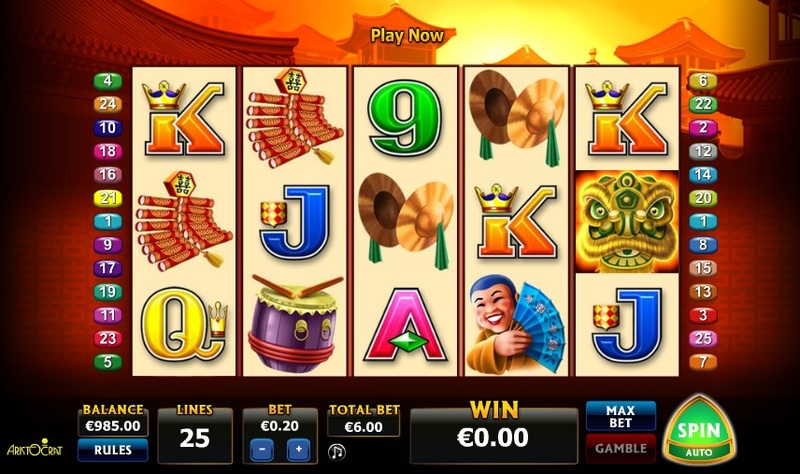 If you count the likes of the Chinese-themed Lucky 88 slot or the underrated Geisha slot as some of your favourite titles then you will definitely want to add this one to your list as well.